Hope Spinel surrounded by diamonds. Photo courtesy Bonhams. It’s the range of subtle color is what really makes spinels useful to a designer. You could create a brooch, bracelet or neckpiece with a lovely sherbet-colored palette of spinels, or use spinels as accents for a flashy cabochon of agate. A deep-colored spinel would be a stunning centerpiece for any ring–and there would be virtually no wear issues! But spinels have gotten a bad name for something that is not their fault. Spinel, like corundum (ruby and sapphire), is easily and inexpensively synthesized. Probably tons of spinels are churned out to fill the synthetic birthstone market. A great many of the “emeralds,” “aquas,” “peridots,” and “diamonds” you see in birthstone rings, necklaces, and pins are synthetic spinels. As a result, many, many people have come to think that “spinel” is synonymous with “fake.” Not so! However, it does mean that designers have to educate themselves first and their customers second, on the beauties and desirability of spinels. Spinel is not often found in caliber-cut shapes and sizes. This, too, makes them perfect for designers as the stones demand unique settings. If you want matching sizes for a particular design, you may end up having to commission a cutting job. That may get to be expensive. 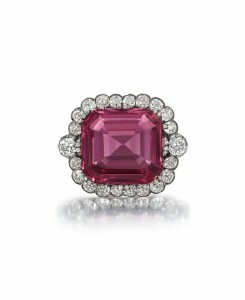 Although at one time the lack of market familiarity meant spinels were often quite reasonably priced, that has changed. When the prices of rubies started going through the roof, buyers looked for a suitable substitute. As a result, spinels are climbing. But it’s still a stone worth looking for. Just remember: The Hope Spinel is taken. Rebecca Strzelec creates an interesting piece by combining organic and geometric shapes in Cross section #5, from her Army Green Orchids series. Photo courtesy Rebecca Strzelec. While shapes may loosely be grouped into geometric and organic categories, jewelry—or any object, really—rarely falls into one camp or the other. 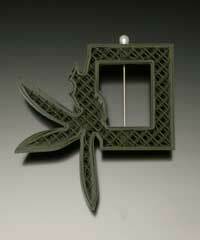 For example, in this piece from her Army Green Orchids series (2006), Rebecca Strzelec, Professor of Visual Arts, at Penn State University, Altoona College, combines a rigid rectangular shape (as well as a girder-like interior) with the gently curving outlines of flowers—orchids, to be exact. Strzelec printed the piece in toy-soldier plastics using flower shapes to make a particular point (read her artist statements here). However, even knowing nothing of the artist’s intent, the piece can be appreciated on its own merits simply by looking at the combination of shapes. Is Wholesaling Right for You? When you wholesale, you sell you work to an outlet of some kind that resells your work—for a profit—to the person who will actually wear it. 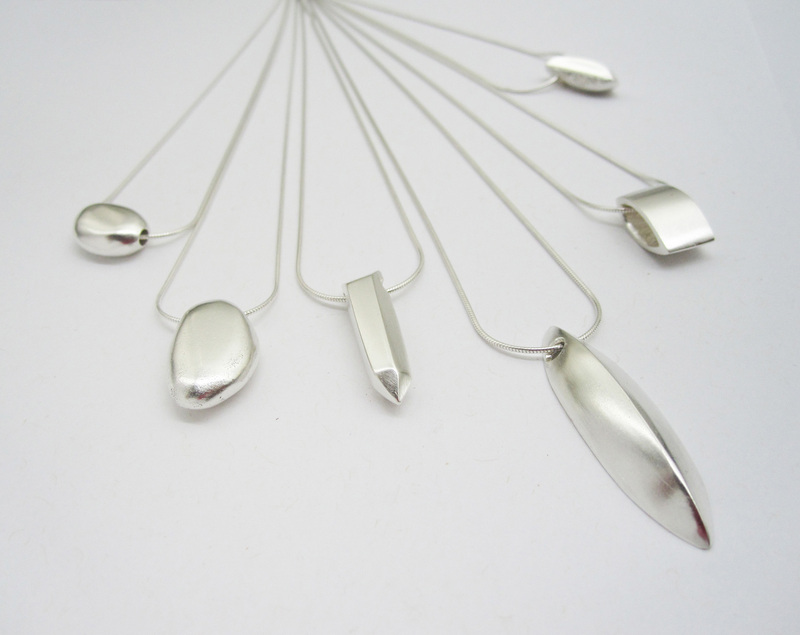 Production jewelry lines are made for wholesaling. The pieces are usually less expensive and easier to produce than one-of-a-kind work. Your distributors can sell them at a reasonable price point, which makes them great impulse items. Customers can easily make the decision to buy a production piece without meeting you, the artist, or even without a lot of input from a sales associate at a gallery or department store. Wholesaling allows you to have your work in a retail venue—all the time—without the expense of a storefront, or the time and bother of creating and maintaining a website. You can present your work in many venues at one time–across the country or on the other side of the world–without having to travel to those venues yourself. 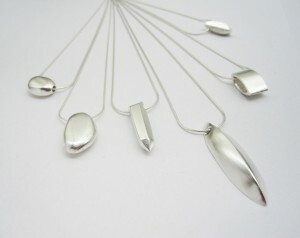 Best of all, it means you can stay in the studio doing what you do best and may enjoy most: making jewelry. Wholesaling may also be a good fit if you work another job. You may not be able to go to retail art and craft shows, and maintaining an Internet presence may take away from what little time you have at the bench. However, wholesaling does separate you from the consumer. You may not get the kind of feedback from gallery or boutique sales staff that you would from the people who will be wearing your work. If the gallery is not local, you may not know how your jewelry is displayed, how often gallery staff actually show pieces to a customer, or what they’re saying about it. Some venues, too, may be less careful handling your work than you are and damage can happen. Probably the biggest drawback to wholesaling is that most galleries—which are probably the primary wholesale venues for jewelry makers starting their career–work on consignment. This means that, although the gallery provides a permanent retail space where your work can be seen, you bear all the costs of production and are only paid when—and if—the work is sold. If you decide that wholesaling might be your best approach to selling your production jewelry line, there are several ways to find outlets for your work.